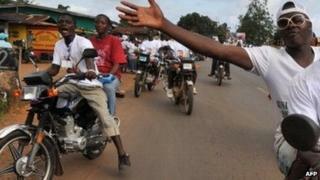 A ban on motorcycle taxis has come into force in Liberia's capital, Monrovia, forcing hundreds of commuters to walk to work. Police set up roadblocks at key intersections to enforce the ban after accusing the bikers of riding recklessly and causing accidents. The privately owned motorcycle taxis are the main mode of transport in Monrovia and many other African cities. Some carry up to five people when they are only meant to take two. Any cyclists caught in the city centre and main roads will have their bikes confiscated and a fine of $200 (£124), according to a police statement read out on state radio on Tuesday evening and Wednesday morning. Later, police spokesman Sam Collins told the BBC there had been a typographical error in the statement and the fine would be $20. One of the motorcyclists, Daniel Howard, said he and his colleagues were angered by the ban. "We are paying taxes [to government] and right now our living condition is at standstill," Mr Howard said. "What we want is for our freedom to be restored." The BBC's Jonathan Paye-Layleh in Monrovia says it is not the first time the authorities have tried to clamp down on taxi motorcyclists. Earlier this year, they were stopped from operating on all streets after 22:00 GMT. However, this additional city centre restriction is having a huge impact on commuters, our correspondent says. Hundreds of people walked to work - some up to 10km (six miles), he says. Monrovia, which has a population of more than a million, has few roads which are in a bad condition and most residents rely on motorcycle taxis because it easy to get around on them, our reporter says. There are few buses and no rail network in the city, which was badly affected by a brutal civil war that ended about a decade ago, our correspondent says. Some people phoned up radio talk shows on Wednesday to complain about the ban. Monrovia resident Morris Koon said the government was "in error" and needed "to plan better" before enforcing it. A man calling from the New Georgia township of Monrovia said the measure could herald a return to "gangsterism" if the commercial bike riders were unable to earn a living. Another resident suggested the government should set up alternative routes for commercial motorcyclists - instead of instituting "such a draconian regulation". But police spokesman Sam Collins said it was being enforced because of "the wave of accidents involving motorcyclists and the taking away of precious lives".